What’s happening here? 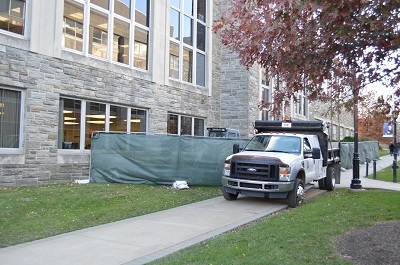 We became accustomed to seeing construction vehicles and materials during the renovation of the Old Falvey Reading Room, now known as the Dugan Polk Family Reading Room. 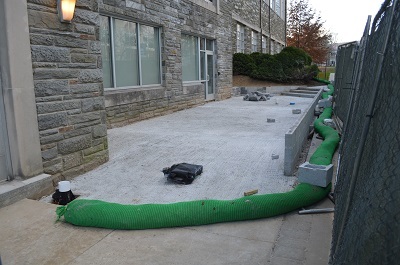 But that project was completed last month and there is now a green barricade extending along the back of Falvey Memorial Library. Behind that green barricade a patio is being constructed, creating a new impressive entrance to the Innovation, Creativity and Entrepreneurship Institute, the Idea Accelerator. The foundation has been laid; a stone wall and paving stones will soon be added. Photographs by Alice Bampton, Communications and Marketing Program Manager.